While there are so many ways to promote your brand to potential clients and business partners, high-quality large prints for event signage, outdoor display, and floor graphics are among some of the most effective, eye-catching displays of your business. As you hit the road with your brand this fall, be sure to match your professionally printed business cards and marketing materials to excellent signage to show off your business. With this, the image of your brand will look polished and prepared for any networking or advertising opportunity that comes your way this season. Consider the many reasons to work with the experienced professionals of FORMost to beautifully showcase your brand with large print formatting for fall events. Are you rebranding for the fall? Boost the look of your business signage on a variety of large print mediums. When you work with FORMost, you will have access to a variety of print mediums to display your brand in a creative and eye-catching way! From PVC signs to yard signs and sandwich board signs, let your high-quality display draw customers directly to your expo booth or storefront this season. In addition to our storefront and event signage options, we also offer high-quality printing on magnetic signs for cars and trucks, as well as creative decals and clings for your car windows to maximize your brand exposure on the road. If you plan on traveling with your brand this fall, be prepared for your next fall expo or event with high-quality banners and posters printed by FORMost! With a wide variety of print selections to choose from, you can display your logo in full color on paper or vinyl, as well as double-sided banners to maximize your exposure at any event! Additionally, you can also present your business information on a full-color vinyl mesh banner at fall outdoor events, along with vertical retractable banners to display beside your booth at trade shows. For businesses looking to rebrand this fall, high-quality floor decals could be an excellent addition to the new look of your storefront. In addition to attracting customers and potential clients at expos and tradeshows, why not create a look of consistency by showing off your brand at your storefront? With new floor decals, you can easily create a cohesive look with your brand colors, employee uniforms, interior decor, and your logo to display a professional appearance for your business. Trust FORMost Graphic Communications for Your Print and Marketing Needs Today! 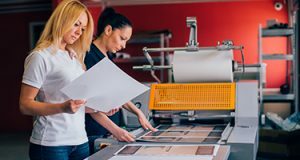 FORMost Graphic Communications proudly provides high-quality print and marketing solutions that produce results for your business. Since 1985, we have been providing an array of services for both national and international clients across a wide variety of industries, including all levels of government. As a privately-held company based in the Washington DC area, we are dedicated to providing exceptional services and products to each of our clients unique marketing needs. To learn more about our products and services for your marketing and print needs, contact us today at 301-424-4242, or visit us on Facebook, Twitter, or Linkedin for more information. This entry was posted on Friday, September 14th, 2018 at 11:12 am. Both comments and pings are currently closed. Screen Designs is now a FORMost company! for order questions or inquiries. © 2019 FORMost Graphic Communications, Inc.